Home. Design. The Beauty of Both. 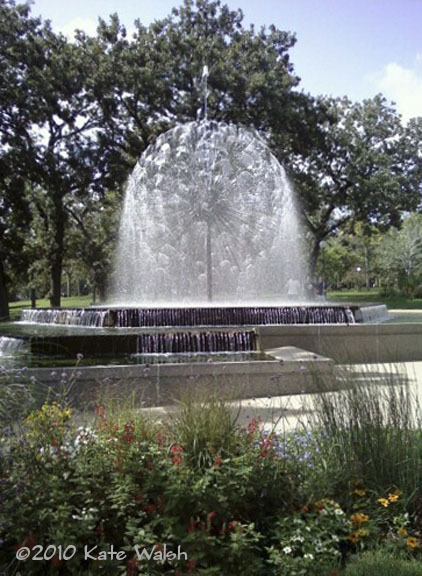 The Berger Fountain in Minneapolis is also known as the “dandelion” fountain. It is located in Loring Park. I have always loved this fountain due to its uniqueness and its sense of playful fun. It’s equally beautiful at night, if not more so. Seeing it closer is a treat as well. The fountain was the subject of some controversy when it was gifted to the city in 1969 and remained controversial until it was built in 1975. It’s now in need of repair and the Park Board does not currently have the money to complete the repairs. They are working on finding funding. The neighborhood group Citizens for a Loring Park Community has started raising funds to help pay for repairs. Read more about the history of this fountain and how you can help fund the needed repairs. Citizens for a Loring Park Community board member Diane Woelm has started raising funds to help pay for repairs. For more information call Diane at 612-377-7752 or Citizens for a Loring Park Community at 612-874-9002. "A Bridge to Something New"
page on the tab above. © 2010 Kate Walsh and designhouse9.com Unauthorized use and/or duplication of this material without express and written permission from this blog's author and/or owner is strictly prohibited. Excerpts and links may be used, provided that full and clear credit is given to Kate Walsh and designhouse9.com with appropriate and specific direction to the original content via permalink.